Let me first say that if you were just starting with QB Online and not converting existing data, you'd probably be happy. I'll quickly add that I am not unhappy; it's just that the switch did have some rough spots. We have used Quickbooks for years. I haven't been entirely happy with it, but I've never found the time to write my own system and that's the only way I could get everything I want. So for fifteen years or so, Quickbooks has been "good enough". It's done the job, but always left me grumpy. Part of that grumpiness was cost. If you upgrade regularly and maintain support, it's actually less expensive to use the cloud version (which includes support in the monthly fee). It's also more convenient as I can now do basic functions from anywhere with my iPhone and iPad. Ahh, but getting used to it is something else all together. Figuring out how to reconcile how it wants to do things against how we want them done can be a challenge. For example, invoicing. What I prefer to do is print invoices to a PDF file and then send an email cover letter with the PDF as an attachment. What QBO wants to do is store the invoice in the cloud and send the customer a link to it. I don't mind that - in fact, it's better because they can pay by credit card or bank transfer directly from that link. But I do not like that the email comes from Quickbooks. I'd rather it came from me. Fixing that is easy enough. 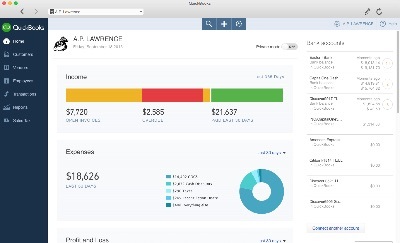 Quickbooks pulls email addresses from customer info, but allows that to be edited. I select and copy those addresses so that I can temporarily replace them with my own. I have QBO send the invoice to me and then I put back the correct customer emails. I now have the correct link in that email which I can put in my own email to my customer. It would be easier if I could just get the links directly from QBO, but this works. Handling bank and credit card accounts is also very different, though as it turns out, much easier. QBO grabs transactions from those accounts online and brings them in for approval. You simply need to accept them into Quickbooks, which is a very quick process, especially after it learns what accounts are typical for specific transactions. If it's already in QBO, for example a check that you entered, the bank transaction will match what you've already done and you simply accept the match. The end result of all this is that when it's time to reconcile, almost all the work is already done for you. Reconciling took me all of fifteen seconds when I first did it! There is some clumsiness to QBO - it's not a fully polished product. However, it saves me time and money so it's "good enough" for me.